We’d love your help. Let us know what’s wrong with this preview of Cristiano and Leo by Jimmy Burns. To ask other readers questions about Cristiano and Leo, please sign up. Probably a book for the fans. Because it is a long and winding story cut into pieces collated alternatively one than another. Boring and with insignificant details. Messi has a growth problem. He needs artificial growth hormone. But to dedicate so many pages on this simple fact? Please. 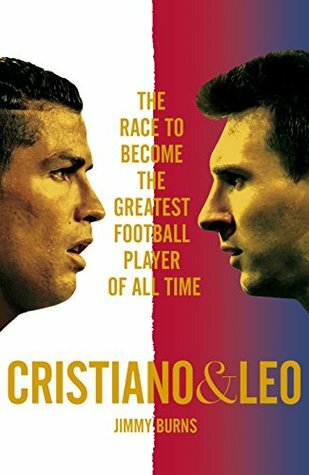 I loved the book my favorite part was every part CRISTIANO RONALDO is in and my least favorite part was every part LIONEL MESSI is in. The first part of the book bored me – I was really struggling to continue it, but I have read enough biographies to know how difficult it is to write them. The second half of the book captured me completely, hence the four stars. In the Jimmy Burns made me curious what was going to happen next, even though I knew was going to happen. I recommend this book for anyone who loves football. Jimmy Burns was born in Madrid in 1953. His father the late Tom Burns met his mother Mabel Maranon while working in the British embassy in Madrid during the Second World War. Jimmy contributes Spanish language media outlets and publishes his books in Spanish translation as Jimmy Burns Maranon. His childhood was spent straddling cultures -Britain, Castille, and Catalonia. He went to school at a British school in Madrid, then a preparatory school in London before studying for his O and A-levels at the Jesuit Stonyhurst College in Lancashire. He took a BA honours degree in Latin American & Iberian Studies at University College, London and an MA in the politics and government of Latin America at the Institute of Latin American Studies in London and The London School of Economics and Political Science. On leaving university, he spent two years teaching English to foreign students, and travelling, gaining experience as a free-lance journalist writing about Latin America and Spain. His early published work included articles for the Catholic Herald and The Tablet. During the 1970's he was commissioned by the BBC to write the script for an Everyman documentary on the Brazilian Archbishop, Helder Camara. He also worked as a researcher for Yorkshire TV, contributing to a critically acclaimed film presented by Robert Kee on the death of Franco and Spain's transition to democracy. In 1977 Jimmy joined the Financial Times and was posted to Portugal as Lisbon correspondent, reporting also on Spain. He also became a regular contributor to the London Observer, The Christian Science Monitor, and The Economist, as well as the BBC, Australian Broadcasting Corporation, and Radio Nederlands. From 1980-2 he worked for the Financial Times' international desk based in London before being posted to Buenos Aires, as the newspaper's southern cone correspondent. He arrived in Buenos Aires in the middle of a military palace coup and three months before the invasion of the Falkland Islands by the Argentine armed forces sparked off a three-month war with Britain. He was the only full-time British foreign correspondent to remain in Argentina prior to, during, and well beyond the conflict, covering the country's transition to democracy, as well as political developments in Chile, Uruguay, and Paraguay. He continued to regularly contribute articles on Latin America to other media outlets in the UK, Europe, and the US.